If you’re confused and frustrated by computers, or you serve as the tech-support person for somebody who is, you might be interested in a PC that’s designed to be much simpler than a typical Windows or Mac machine, yet can still perform popular tasks like Web surfing, emailing, photo viewing and video chatting. I’ve been testing just such a computer, called the Telikin. It’s an all-in-one desktop, with a touch screen, that starts at $699 and comes from a small Philadelphia-area start-up called Venture 3 Systems. To create the Telikin, the company converts standard PCs from the Taiwanese manufacturer MSI by replacing Windows with the Linux operating system and then overlaying that with a greatly simplified user interface and apps of its own design. As simple as it is to use, the Telikin I tested had some flaws and glitches to frustrate most tech novices. The interface is dominated by a row of big, blue buttons down the left side of the screen, with labels like Email, Photos, Calendar, Web and so forth. Large windows display content, and emails use a big, bold font for easy reading. The home page prominently displays news headlines and weather, and even a quote of the day. There is a built-in feature called Tech Buddy that allows a friend or relative to remotely take over the computer, with permission, to provide help. After several days of testing the Telikin, I found the interface logical and the built-in apps worked pretty well, albeit sometimes on a very basic level. However, I can only give the Telikin a qualified thumbs up, because I kept running into bugs and limitations. Company officials acknowledged these problems and said they are fixing them. But if you buy a Telikin, you are betting that they will do so. 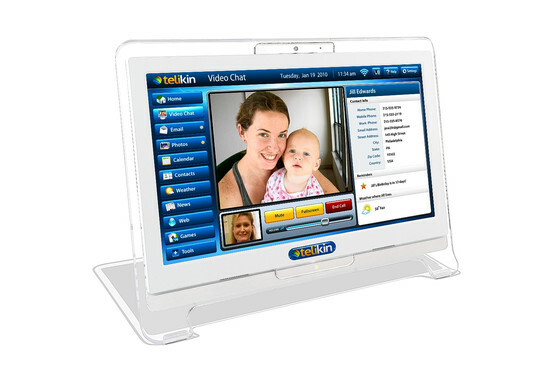 Telikin is an all-in-one desktop, with a touch screen, that lets users send and receive email, view photos, and conduct video chats via Skype, above, among other things. The company says it originally designed the Telikin for seniors, but is finding that older boomers are interested as well. Personally, because I know seniors who are computer masters and middle-age people whose PCs befuddle them, I’d say such a machine might appeal to anyone of any age who needs or craves greater simplicity in a PC. It’s available directly from telikin.com, or from Fry’s, an electronics retailer whose stores are mainly in the West. There are two models. The base unit, at $699, is white, has an 18.6-inch screen and a 320-gigabyte hard disk. The second model, at $999, is black, has a 20-inch screen and a 500-GB hard disk. Both have touch screens that can be operated by finger or with an included stylus. Both also can be controlled with a traditional wired mouse, which is included along with a wired keyboard. Each model has 2 GB of memory, multiple USB ports, a DVD drive and a memory-card reader. The company offers an optional service that gives hand-holding support on basic questions, such as, “How do I set up a Facebook account?” and includes the ability to back up the computer to a remote server for $10 a month. In my tests, I was able to send and receive email on one of my own accounts; conduct video chats via Skype; view shared photos on Facebook; surf the Web; make calendar appointments; and play simple built-in games, like solitaire and mahjong. I could create and read word-processing documents in Microsoft Word format; and view, but not create or edit PDF files and PowerPoint presentations. I found the company’s tech support people to be helpful and patient, and the machine comes with some useful, if very basic, instructional videos, although there’s no real manual provided. The Web browser is pre-loaded with a series of visual bookmarks for common sites, and you can save your own favorites. But bugs and limitations seriously detract from the Telikin. For instance, at first, my test unit frequently froze, requiring a reboot each time. The company remotely upgraded its software, and the freezing was almost, but not entirely, eliminated. I was also unable to attach photos to outgoing emails. 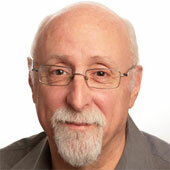 The company said this was a known, but intermittent, bug that will be fixed by the end of the month. Another example: My Telikin test unit couldn’t complete an online backup because, according to a scary error message, a Web file had “vanished.” Again, the company said it knew of the problem and was fixing it. My test unit also came with an odd little add-on microphone poking out from the bottom, even though it had a built-in mic at the top. The company said it added the extra microphone because it wasn’t satisfied with the quality of the internal one. And then there are the limitations. The built-in email program lacks the common Reply All and Forward functions, and the browser has no Refresh function. The company said it left these out because it feared they might confuse some seniors. Now, it is thinking of adding them. Also, the Telikin can’t view spreadsheets, though again, the company says it is working on adding that ability. On some emails I sent from a Mac, but not from my Windows PCs, attachments or text didn’t come through. And the remote-control Tech Buddy feature is harder to set up on a Mac. The company conceded it did very little testing of the Telikin’s compatibility with Macs, so if you are a Mac user planning on buying a Telikin for a relative, you might have problems. Bottom line: The Telikin is a good idea with a decent design that suffers from flawed execution. If you have a friend or relative who could benefit from such a computer, you might consider the Telikin, but you should think about waiting until the company fixes the flaws.